Nearly half of business owners surveyed identified their top challenge as staying ahead of rapid changes in technology in 2018. Additionally, 23 percent emphasized that budget constraints were top of mind in maintaining and growing their endeavors. For the newer small business, budget was their top challenge, which is expected for businesses in operation less than a year. Despite the challenge to keep pace with digital innovation that companies face today, survey respondents cited the many benefits of being a small business owner including work life balance. Eighty percent of respondents say they currently maintain enough freedom and flexibility to support their work-life balance. Respondents maintain a high level of mobility, working off-site and in multiple locations instead of at a fixed venue. The younger the business (less than one year old), the more likely it is to have employees who work primarily from mobile devices. As companies grow, mobile use gives way to other devices and digital options for how work gets done. In navigating the demands of both budget and technological readiness, over 30 percent of small business respondents said they are likely to turn to familiar sources (a family or close friend) for technology guidance or help with their computers, email or software. With 26% of respondents stating they have a formal relationship with a support or service establishment, small businesses said comfortable, human interaction was key in how they sought help. Expansion into digitally run businesses also requires some safeguards, though not all small businesses feel equipped to take the necessary steps to protect themselves alone. In fact, nearly one quarter of small businesses say they have yet to take any measures to introduce digital safeguards and protect their sensitive data. For those who do want to address the security of their data, 70 percent suggested they would prefer to pay for support in matters of cybersecurity, rather than do it themselves. For those actively addressing the security of their data and devices, 30 percent are using encryption software, and nearly 40 percent are ensuring their employees are using anti-virus software. As small business owners plan for both the exciting upcoming moments and potential challenges of 2018, Microsoft Store is there with technology in hand and true small business solutions in mind. Resources in every Microsoft Store like business sales specialists, who know the changing needs of small business owners and are armed with the latest research like this survey, are critical in making decisions about which solution is right for individual businesses. Ongoing, free opportunities like workshops, Office Hours and networking events give business owners continuing education about the changing technology landscape and the chance to meet other, likeminded, small business owners. 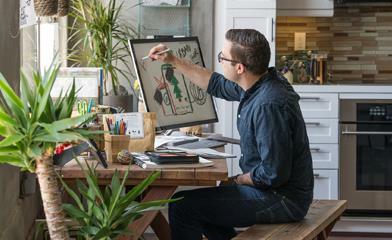 Microsoft Store can also provide information on the latest technology solutions for small businesses, like Microsoft 365 Business, which includes Office 365 productivity and collaboration tools for empowering your employees, as well as device management and security tools to safeguard company information across Windows 10 PCs, mobile devices, and apps. From a single console, small business owners can implement and manage security policies to ensure PCs are up to date and secure, preventing security vulnerabilities that cyberthieves often exploit. Visit your local Microsoft Store to meet with a business sales specialist, experience Microsoft 365 and other technology solutions, and discover free resources like Office Hours that will help you to achieve more. Here’s to a great 2018 for you and your business. * SurveyMonkey. “Small Business Insights.” Survey. 11-15 Oct. 2017. Based on a sample of 1,300 self-identified small business owners with a range of 1 to 200 employees in the United States.